We have stayed at Crazy Mzungo's Vacation rental in Zanzibar twice already with friends and family, and will certainly be returning in July with a different group of friends. t ticks lots of boxes for our family. We have the freedom yet the security right on the beach. The last time we had the place to ourselves so felt very private and personal. There is a choice of sunloungers on the beach and comfy sofas in the bar area in the shade. The rooms are spacious and clean with the front door directly onto sand. Leave your shoes in your case as you wont need them. The staff are friendly and extremely helpful, nothing is too much trouble. I would recommend this place for families, couples and single people. A great place to relax and enjoy the view. All rooms have their own bathrooms en suite - no sharing! 5 unique themed Accommodation options to suit you - all with a "Crazy" twist, of course! Choose your favorite - the Jozani Jungle Room, Crazy Colobus Monkey Banda, the "Elvis" Double, the Bob Marley Banda or the "Om Shanti" Room! All rooms are unique and individually themed to add a fun and magical twist to your holiday in Zanzibar! Crazy Mzungo's is ideally located on the idyllic East Coast of Zanzibar, featuring spectacular scenery and turquoise waters. Away from it all, yet close enough to the action... 25min walk down the beach and visit cafes, bars, restaurants, supermarkets. 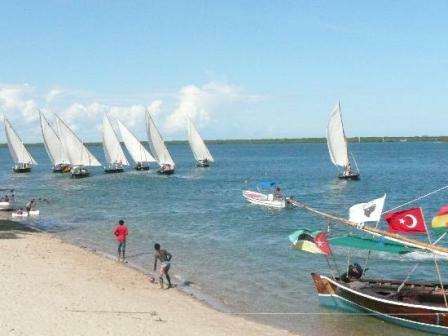 The East Coast is 45 min from Stone Town Airport on good roads and has become a water sport haven. You can kite from from the beach at Crazy Mzungos, at your own risk, of course.. We have seen many a kiter up a coconut tree! At Crazy Mzungo's you will feel like part of the family in no time at all - all you have to do is take off your shoes and relax..this is a fun place to unwind, don't expect a sterile resort-like atmosphere. Shaded and cushioned loungers are provided for lazy days on the beach, the Cocktail menu changes daily! Staff are friendly and you will be speaking "mambo jambo" in no time at all! Crazy Mzungo's is built in a tropical garden with coconut trees, steps from the beach. Romantic couples prefer the "Elvis" or "Om Shanti" Double Rooms whereas Families and groups of friends love the "Jozani Jungle Room" as it sleeps six and has 2 Bathrooms. The newly added "Bob Marley Banda" and Crazy Colobus Bandas sleep 4 each with stunning Makuti roofs and indoor/outdoor nature showers. All bungalows have Ensuite Showers, Cupboards, Fans, colorful and fancy 3 door Mosquito Nets. Remember - Cold water showers are perfect after a hot day in the Tropics! Life in the tropics is Al Fresco.. kick off your shoes and enjoy the beachfront with lovely umbrellas and cushioned loungers. Enjoy a Cocktail made by the Crazy Barman (new recipe daily), order a Seafood lunch from the kitchen or watch your favourite movie or TV show via the DSTV satellite in the lounge area. Bring your laptop, stay in touch with friends whilst getting a tan! Wifi on site! Happy Hour is between 5-6pm daily with lots of activities and fun events like Sunday brunch and many more. No mass tourism, no frills, just lots of fun in the sun!